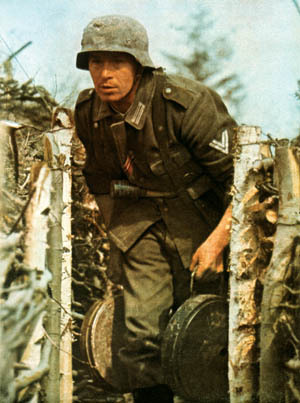 The Wehrmacht employed numerous types of land mines throughout the war. German land mines were insidious weapons—killing or maiming thousands of Allied soldiers and civilians. In one incident toward the end of 1944, American soldiers came across nonmetal mines in Lorraine, France. In a single minefield they found 12,000 mines made out of Bakelite or wood, which made them impossible to locate with metal detectors. By 1945, the U.S. Army in Europe recorded that mines were responsible for 2.5 percent of combat fatalities and for 20.7 percent of tank losses. German commanders considered the land mine a very effective defensive weapon and so went to great lengths to make extensive use of it. Minefields were used chiefly to cover defensive operations and retreats. In a static situation the Germans regarded minefields as an element of frontline positions, laid out according to an overall mine plan developed in close conjunction with fields of fire. German doctrine for minefield location was modified during the war so that, instead of laying dense minefields in front of the main line of resistance, as had been the practice, mines were dispersed. German engineers believed it necessary to survey the location of minefields and individual mines within the fields. They were instructed to choose reference points for minefields that could be identified easily, such as near a railroad grade crossing, at road intersections, or at the edge of a village. In some instances, however, the Germans were forced to use guide wires and auxiliary fixed points. A type of auxiliary fixed point that proved practicable was the center of an equilateral triangle with sides 15 to 25 feet long. The corner points and the fixed point itself would be marked by stakes, rails, concrete or steel girders about three feet in length and connected with barbed wire. Such a fixed point could be reestablished easily after heavy shelling was received. Fixed points could also be reference points found on a map. Distances were measured in meters and azimuth readings were taken by compass. The Germans believed it was advantageous to lay a continuous series of reference points 600 to 900 feet apart, through a division sector. These reference points would be used to determine the locations of ditches, trenches, obstacles, and pillboxes as well as minefields. To assure the greatest possible effect, minefields normally were laid out in patterns, but there were exceptions to this practice in sectors where the Germans did not intend to undertake offensive actions. There, they dispersed the mines irregularly in the areas between defensive positions. The main fields or belts of antitank mines were laid in a uniform pattern with a sprinkling of antipersonnel mines at the forward edge of the field. Both types of mines might be fitted with antilifting or antihandling devices intended to cause the mine to detonate if an attempt was made to remove it, and some of the antipersonnel mines would also have trip wires attached. In turn, a number of antitank mines would be laid at the forward edge of an antipersonnel minefield to prevent armored vehicles from detonating the main belt of antipersonnel mines. In addition, the forward edge of minefields were often sown with explosive charges placed in wooden boxes fitted with pressure fuses. These acted as both antitank and antipersonnel mines and discouraged the use of metal detectors to locate the mines. Forward of most fields, and particularly in front of clear lanes, mines might be found widely spaced or scattered at random in unmarked groups. Mines also were laid in lines running out at right angles from the forward edge of the minefield in order to damage vehicles moving along the field in search of lanes. Pressure-type antitank and antipersonnel mines were laid in lines. For measuring distances, a mine-measuring wire 24 meters long was used, with meter increments marked off and with five-inch-diameter rings on the ends of the wire. This measuring wire, in addition to measuring the distance between fixed points, served to lay out right angles by staking out a triangle with sides of six, eight, and 10 meters, respectively. Spaces between mines were determined by reference to the marks on the wire and four rings on one end used to set rows. The density of a minefield depended on the interval set between mines and the number of rows used. Clear lanes were left open for patrols to transit, and passage lanes for assault troops. New lanes were set periodically and old ones closed. An exquisitely preserved bakelite landmine that would be undetectable. Mine belts were normally laid in sections of 80 by 105 feet. The sections usually were staggered, and, for extensive mine belts, combined in units of three or four to form forward or reverse arrowheads, or echelons. The Germans emphasized that minefields were to be covered by fire, although during a hasty withdrawal they often did not follow this principle. It was common for a minefield to have a listening post with two men at the rear edge; about 70 or 80 yards to the rear a covering party of four or five men was placed with one or two light machine guns. When the Germans were conducting a hasty withdrawal, they usually laid a large number of small nuisance mines and minefields. These fields contained many different types of mines, which often were unmarked and showed evidence of being hurriedly laid. The lack of pattern uniformity made detection and clearing laborious and dangerous. Mines were also laid close to or on roadways, on airfields and railways, and along telegraph and telephone lines. Hard-surfaced roads were usually avoided in the case of hastily laid mines, but khaki-painted antitank mines sometimes were placed on the surface at dips in the road in the hope that drivers would be unable to avoid them. The Germans also placed mines along the shoulders of a road opposite narrow places where drivers might have to swing wide to pass and at the entrances to defiles where they had to pull off the road to wait for vehicles moving in the opposite direction. Other places usually sown with antitank mines were turnouts, sharp bends, and well-worn wheel ruts. The Germans attempted to make their mines difficult to detect. They buried them as much as 24 inches below the surface so that they would explode only after a number of vehicles had compacted the earth sufficiently to set off the fuse. They placed explosives in wooden boxes to prevent discovery by mine detectors, and they made tire prints in the soil over the mine by drawing a detached axle and wheels over the mine. They showed considerable ingenuity in setting antipersonnel mines randomly on the line of a possible enemy advance. Road demolition areas were sown with antipersonnel mines, and kilometer marker posts at points where drivers would have to dismount to read directions were similarly treated. Mines also were placed in ditches, often close to the tripwire peg of another mine. Nuisance fields were closely spaced, occasionally so close as to cause sympathetic detonation. This was particularly possible when mines were laid with their pressure plates almost flush with the surface of the ground and only lightly covered with earth. The Germans also set dummy minefields. These took various forms. In some cases a trip wire was laid to give the appearance of a minefield perimeter wire, with the usual lanes and the ground disturbed at regular intervals. Scrap metal, often dispersed with real mines, was placed in shallow holes to cause a reaction by mine detectors. Dummy mines were often connected to live booby traps. The Germans stressed the marking of minefields and attempted to mark them in such a manner that they could not be recognized by the enemy but could easily be found by their own troops. Initially, the methods of marking minefields were not uniform. The front edge of a field was often unmarked. Because of many accidents caused by friendly minefields, the Germans issued orders making proper marking mandatory. Typical examples of markings included the placing of a single knee-high wire, use of cattle fencing, placing of empty mine crates, and signs. Marking stakes were also used to indicate minefields. The stakes were flat on one side for a length of about eight inches, with the flat surface painted red and the letter M (Minen) in black. Such stakes were used only on the friendly edges of minefields. Signs were painted in red and white on boards or pieces of sheet metal and fastened to two stakes. The edges of minefields were indicated with signs marked with horizontal stripes. Edges of lanes through the fields were indicated by vertically divided signs, with the white portion on the side of the lane (safe) and the red portion on the side of the minefield (danger). The reverse sides of the signs, the sides toward the enemy, were painted olive drab. If red paint was not available, the Germans substituted black and white signs. These were painted with the words Minen (mines), Gasse or Gassen (mine lanes), and Entimint (an area cleared of mines). Minefields were indicated by vertical lettering, dummy minefields with slanted letters. This distinction, however, was supposed to be made known only to German engineers because it was feared that other troops, if taken prisoner, might divulge the locations of dummy minefields. The Germans were methodical not only in laying mines but in planning and recording minefield information. Mine plans provided technical details on one or more fields. A mine map showed all mine obstacles within a sector and their tactical significance, but without technical details. A mine map usually showed the name of the obstacle (minefield) and designation of the unit that laid it, the name of the area in which the obstacle was located, a grid reference, the obstacle shown in a small sketch in red, the date the minefield was laid, and the name and rank of the officer or noncommissioned officer in charge of laying the field. Data on the mines used included the number, type, and fuse; whether the mines were dug in; the number of rows, and number of mines per row; any information about fences; and information about special features that distinguished the field. Minefield type identification was indicated by colored lines drawn diagonally across the upper right corner of the mine map, identifying the type of minefield. A red diagonal line designated fields that could not be cleared because some or all the mines were booby-trapped; a yellow diagonal line designated fields that could be cleared by using data from a mine document; a green diagonal line designated dummy minefields; and mines taken up or exploded were marked in red. The number of the minefield plan and unit designation appeared on the upper right corner of the plan. A drawing of the minefield was included, using a scale from 1:500 to 1:2,000. Other information included the shape and size of the field, its pattern, the location of booby-trapped mines, the location of survey points with azimuth and distances, the location and type of any warning fence, the location of front lines and fortifications, neighboring minefields, mine lanes, terrain features, and any special features. German engineer preparing to set mines. Mine plans were provided to company or battalion command posts—with copies distributed to the engineer company that was in charge of the minefield, to the division, to the army, and to a central file at Dessau-Rosslau. Engineers provided frontline troops with instructions or sketches with the approximate location and extent of minefields. These sketches, as a rule, did not contain details on types of mines or fuses or on minefield patterns. Army headquarters usually designated certain areas for fields of scattered mines. In such a case, mine reports took the place of mine plans. Normally, mine reports contained the number of the order authorizing scattering of mines, the designation of the units scattering the mines, the name and number of the field containing scattered mines, the map location of the scattered minefield, the number of mines scattered by types and fuses, and the number and type of booby-trapped mines and kinds of booby traps. The Germans entered the war with just two types of antitank mines and one type of antipersonnel mine. By the end of the war they had 16 different types of antitank mines and 10 types of antipersonnel mines, and they employed many different types of booby traps or improvised devices. From 1942 on they placed increasing importance on the mine as a weapon of attrition. 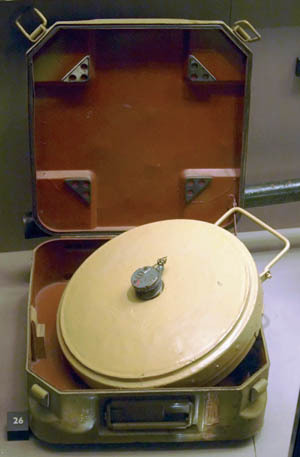 The S-mine (Schrapnellmine), also known as the “Bouncing Betty,” was the best-known version of a class of antipersonnel mines referred to as bounding mines. When triggered, these mines were launched into the air and then detonated at about waist height. The explosion released a lethal blast of steel balls and steel fragments in all directions. Developed in the 1930s, the S-mine was used extensively during the war. It was designed for use in open areas against unshielded infantry. Two versions were produced, designated by the year of their first production: the SMi-35 and SMi-44. There are only minor differences between the two models. More than 1.93 million were produced. French troops first encountered the S-mine in the German Saar in September 1939. The French nicknamed the mine “the silent soldier.” Germany used the S-mine heavily during defensive operations later in the war. The S-mine was a steel cylinder less than 13 centimeters (five inches) tall, without its sensor, and only 10 centimeters (four inches) in diameter. A steel rod protruding from the mine’s top held the main fuse, where its trigger or sensor was attached. The SMi-35 had a central fuse, while the SMi-44 had an offset fuse. It weighed approximately four kilograms (nine pounds). The main explosive charge of the mine was TNT; the propelling charge was black powder. The standard pressure sensor was ignited by a percussion cap. The main fuse was designed to delay the firing of the propelling charge for approximately four seconds after the mine was triggered. The explosion of the propelling charge sent the mine upward into the air and activated three short-delay pellets between the propellant charge and the three detonators. These pellets delayed the mine’s detonation long enough for it to reach a specific height before exploding. A wooden pressure sensor to detonate a remote TNT mine. The standard pressure sensor was designed to activate if depressed by a weight of roughly seven kilograms (15 pounds) or greater. This was to ensure it was not set off by wildlife. A trip wire adapter for the mine used a shallow Y-shaped device and would trigger the mine if the trip wire was pulled away from the mine. The S-mine was normally triggered by a three-pronged pressure fuse. It could also be modified to be triggered by a trip wire or could be triggered manually. The time between triggering and ignition of the propelling charge varied between 3.9 and 4.5 seconds, depending on the age and condition of the mine. According to German documentation, the S-mine was lethal within 20 meters (22 yards) and could inflict casualties within 100 meters (110 yards). A common misconception about the S-mine was that it would not detonate until its victim stepped off the trigger. The mine would detonate whether the trigger was released or not. The most effective way to survive the mine’s detonation was not to flee but to fall to the ground lying face down as quickly as possible. The S-mine was constructed mostly of metal, so it could be easily located by metal detectors. The mine could also be detected through careful manual probing, a time-consuming process. It was important to probe at an angle that would not accidentally depress the pressure sensor. Once an S-mine was discovered, disarming it was fairly simple. To prevent triggering while the mine was being planted, the pressure sensor featured a hole where a safety pin kept the sensor from being accidentally depressed. This pin was removed once the mine was planted. If the discovered mine was fitted with the pressure sensor, the personnel disarming it would slip a pin into this hole. If the device was armed with a trip wire or electrical trigger, this could simply be cut. The Germans were known to use booby traps to discourage this, so caution was advised. The mine could then be removed carefully from the ground and the sensor easily unscrewed. The Schu-mine 42 was a model of an antipersonnel blast-type mine. 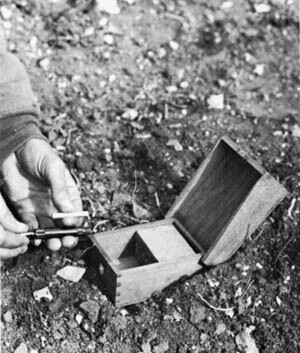 It consisted of a simple wooden box with a hinged lid containing a 200-gram block of cast TNT. A slot in the lid pressed down on the striker retaining pin, and sufficient pressure on the lid caused the pin to move, releasing the striker that triggered the detonator. The mine was cheap to produce, and its wooden body made it difficult to detect. The Glasmine 43 was another antipersonnel mine. To make the mine less detectable, the entire body was made from glass. Initially, only mechanical igniters were used, but later models had chemical igniters. However, the Glasmine 43 was not produced in large numbers. The Tellermine (or T-mine) was a German antitank mine developed between the wars. The Tellermine 29 was a round metal-cased antitank blast mine. It first entered service in 1929. Although replaced by later models, this model did see limited service, notably after D-Day in France, where Allied troops reported encountering it. The mine used a pressure or a trip wire fuse. It was also fitted with two secondary fuse wells that enabled the fitting of antihandling devices. The Tellermine 35 (T.Mi.35) was used extensively during the war. The mine was made of sheet steel and had a slightly convex pressure plate on the top with a central fuse well. It also had a fuse well on the side and bottom for anti-handling devices. For use on beaches and under water, the mine could be deployed inside an earthenware or concrete pot that acted as a waterproof jacket. The Tellermine 42 (T.Mi.42) was a metal- cased antitank blast mine. Based on the Tellermine 35, it had an improved resistance to blast because it was smaller than the 35. The Tellermine 43 was a circular, steel-cased, antitank blast mine. It was a modified version of the Tellermine 42 that used simpler production techniques. Between March 1943 and the end of the war, over 3.6 million Tellermine 43s were produced. The Tellermine was designed with a circular casing rising toward the center, where a large, flat pressure plate was located. A rectangular metal carrying handle was fitted to the side of the mine. The pressure plate sat over the fuse well. At the bottom of the fuse well was a booster charge, surrounded by a doughnut- shaped main charge of 5.5 kilograms of TNT or Amatol. The mine had secondary fuse wells on the side and base to enable antihandling devices to be fitted. Additionally, it could be fitted with an antitampering device, detonating the mine if the pressure plate was lifted. The mine could also be fitted with a tilt rod fuse, screwed into to the side fuse well. 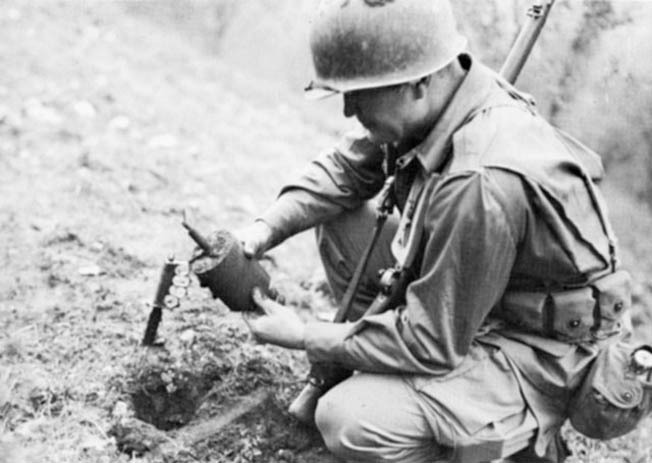 An allied soldier inspects a defused mine. In contrast to the “dinner plate” mines like the Tellermine were “bar mines” such as the Riegel mine 43 or Sprengriegel/R.Mi. 43. Its long narrow body was designed to increase the probability of a vehicle triggering it. Made of steel, the mine had a thin, oblong shape (800 millimeters) and consisted of lower and upper metal trays and an explosive block of four kilograms of TNT. It used two fuses inserted into either end of the block although it could be used with an additional top pressure fuse. More than three million were produced between 1943 and 1945. The mine was almost impossible to disarm since corrosion of the wires in the fuse made it sensitive to touch. In addition, the mine could be fitted with up to three antihandling devices. Possibly the most advanced German antitank mine of the war was the minimal metal Topfmine. The Topfmine was a circular, minimum metal antitank blast mine that entered service in 1944. The mine was in a case made of compressed wood pulp, cardboard, and tar along with glass plugs and components designed to be undetectable by Allied mine detectors. Often the only metallic part of the mine was the detonator. To enable the mines to be found by friendly forces, they were painted with a black sandy substance called Tarnsand. Allied forces found that although the mines were undetectable by Allied mine detectors, German mine detectors could locate them. After the war Tarnsand was discovered to be mildly radioactive, permitting the German mine detectors, which incorporated a simple Geiger counter, to locate them. The Panzer-Stabmine 43 antitank mine, together with the Hohl-Sprung mine 4672 (hollow-charge jump mine), was the first mine to combine a shaped charge warhead with a tilt rod detonator. A Panzerfaust warhead was mounted in a metal holder on a wooden panel, which was buried with a rod protruding above the ground. When a vehicle passed over the mine, the rod was forced sideways, triggering a black powder charge at the base of the projectile, launching it out of the ground and into the belly of the passing vehicle. The 125mm warhead’s 1.6- kilogram shaped charge could penetrate over 100mm of armor and was capable of destroying most tanks. However, the mine was not issued until January 1945, due to manufacturing problems. Only 59,000 were produced because it was felt that the warheads were better employed as antitank handheld rockets. During operations in North Africa, many large minefields were put down as barriers. In time many of these locations went unmapped, and markers were lost or covered with drifting sand. Even today, the Red Cross estimates that over 27 percent of Libyan farmland is unusable due to World War II minefields. In Europe, minefield clearance is still being undertaken in the Netherlands and France. Although the war ended more than six decades ago, its legacy is still with us in the form of these deadly devices. Tags Afrika Korps, Allies, Axis, Bouncing Betty, European Theater, Hohl-Sprung mine 4672, Landmine, Nazi Germany, Panzer-Stabmine 43, Schrapnellmine (S-mine), Tellermine (T-Mine), Topfmine, wehrmacht.